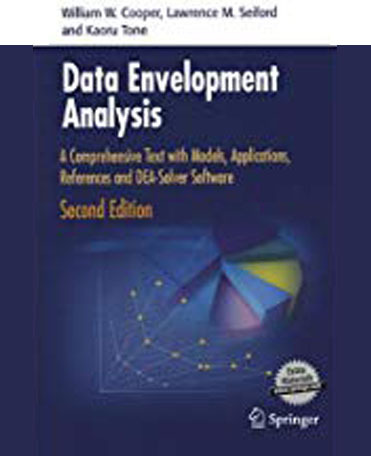 Data envelopment analysis : a comprehensive text with models, applications, references, and DEA-Solver software : 2nd ed. General discussion. Basic CCR model. CCR model and production correspondence. Alternative dea models. Returns to scale. Models with restricted multipliers. Non-discretionary and categorical variables. Allocation models. Data variations. Super-efficiency models. Eficiency change over time . Scal elasticity and congestion. Undessirable outputs models. Economies ò scope and capacity utlilization. A dea game. Multi-stage use of parametric and non-parametric models. Chương 1. Biến cố, xác suất biến cố; Chương 2. Biến ngẫu nhiên; Chương 3. Vectơ ngẫu nhiên; Chương 4. Thống kê; Chương 5. Mô hình hồi quy tuyến tính; Chương 6. Bài tập. Giới thiệu số sai, tính gần đúng nghiệm thực của một phương trình, tính gần đúng nghiệm thực của một hệ đại số tuyến tính, nội suy và phương pháp bình phương bé nhất, tính gần đúng đạo hàm và tích phân xác định, tính gần đúng nghiệm của bài toán côsi đối với phương trình vi phân thường. Physics for scientists and engineers : volume 1 : 8th ed. As a market leader, Physics for scientists and engineers is one of the most powerful brands in the physics market. However, rather than resting on that reputation, the new edition of this text marks a significant advance in the already excellent quality of the book. While preserving concise language, state of the art educational pedagogy, and top-notch worked examples, the Eighth Edition features a unified art design as well as streamlined and carefully reorganized problem sets that enhance the thoughtful instruction for which Raymond A. Serway and John W. Jewett, Jr. earned their reputations. Likewise, Physics for scientists and engineers, will continue to accompany Enhanced WebAssign in the most integrated text-technology offering available today. In an environment where new Physics texts have appeared with challenging and novel means to teach students, this book exceeds all modern standards of education from the most solid foundation in the Physics market today. Physics : principles with applications : 7th ed.